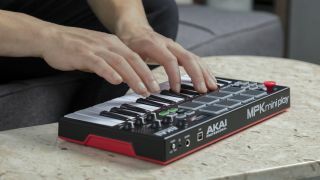 Akai’s MPK Mini is a popular option for anyone who wants a USB MIDI controller keyboard that they can drop in a bag and take anywhere, but it’s not much use if you don’t have a computer to hook it up to. The MPK Mini Play is different: not only can it be used with your DAW and plugins, but it also comes loaded with 128 sounds and a built-in speaker, meaning that it can be played as a standalone instrument anywhere you like. Three AA batteries are all that’s required to power the MPK Mini Play, and sounds can be browsed on an OLED display. Strangely, there doesn’t appear to be a list of presets on the Akai website, but we can tell you that, in addition to the 128 sounds, there are also ten drumkits. Sounds can be edited using the four knobs, which can also send MIDI data when in controller mode (two banks mean that eight knobs are actually assignable). There are 25 synth-action mini keys, eight red backlit drum pads (again, two banks), a 4-way joystick for pitch and modulation control and a built-in arpeggiator. Audio output is via a 1/8-inch headphones jack. The Akai MPK Mini Play costs £109 and should be shipping later this month. Find out more on the Akai Pro website.